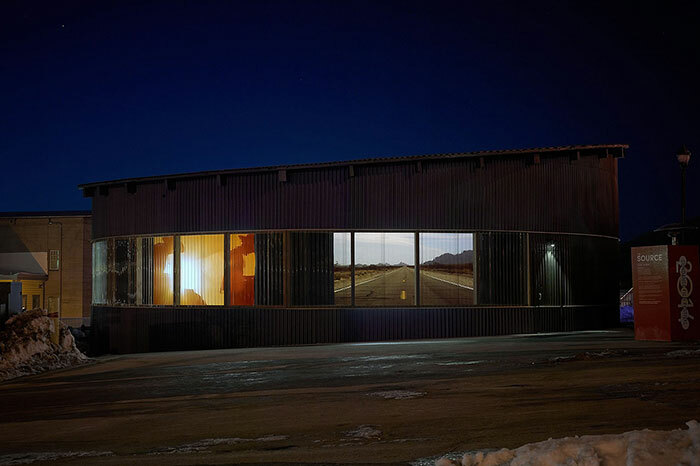 New York (February 24, 2014) – Renowned artist Doug Aitken marked the U.S. premiere of his installation “The Source (evolving)” at New Frontier at the Sundance Film Festival in Park City, Utah with AV support from WorldStage, which provided design consultation, equipment and programming. New Frontier at Sundance champions films that expand, experiment with and explode traditional storytelling. “The Source (evolving)” is a kaleidoscope of fast-paced, candid conversations with pioneers from different artistic disciplines from around the world. Aitken asks these shapers of modern culture where does the creative idea start and what is the journey to the finished creation? “The Source (evolving)” was housed in the Pavilion, a new 2,000-square-foot circular structure adjacent to Main Street created in collaboration with U.K. architect David Adjaye. 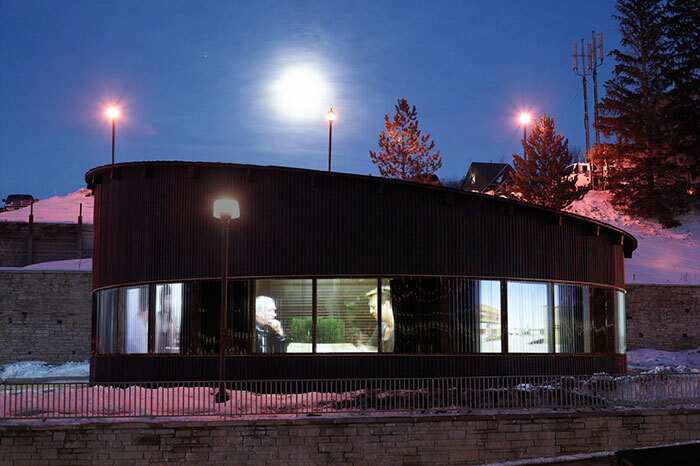 Six-channel video projections were arrayed along the inner circumference of the cylindrical structure’s interior and were visible from the outside at night when curtains were withdrawn to allow the screens to be viewed through The Pavilion’s large windows. WorldStage previously worked with Aitken on “Sleepwalkers,” a multi-screen cinematic experience projected on seven facades of The Museum of Modern Art in New York City; a special single-channel version of that installation was presented at New Frontier at Sundance in 2008. For “The Source (evolving)” the Pavilion’s partition walls created six adjacent, high-quality viewing theaters each equipped with a Panasonic PT-DZ7700 HD projector and Harkness Hall projection screen provided by WorldStage. WorldStage also supplied a near-field monitoring sound system and a directional Brown Innovations Soundbeam system for the theaters. “We not only designed and specified the media components but also the wall construction to minimize crosstalk between the six separate theaters, which is typically an issue for installations like this,” says WorldStage project manager Randy Briggs. Aitken also developed an accompanying interactive website for “The Source (evolving),” which connected audiences not attending Sundance with the work and which will serve as a living archive that he will continue to populate with interviews. For WorldStage, President Josh Weisberg created the system design and acoustics specs, Randy Briggs managed the project and Paul Clements handled the physical installation.